The typical computer workstations consists of a computer, one or more monitors, and any number of peripheral electronics. It is no surprise that computer workstations, whether in the home office or commercial environment, consume a significant amount of energy due to the computer and peripheral electronics being left on (even when not in use). Among office plug loads, computers and monitors account for the largest share of energy in the office – 66%, while other office electronics such as printers, faxes, multi-function devices, and computer speakers account for 16% of plug load energy use. While many computers available today come with power management features, they are not enabled out of the box and most users do not implement them properly as they are often perceived as disruptive to the user experience. According to the U.S. Department of Energy (DOE), a desktop computer and monitor that are on for eight hours per day for 262 working days per year uses approximately 245 kWh per year, which translates to about $29.42 with the U.S. average utility rate of $0.12/kWh. 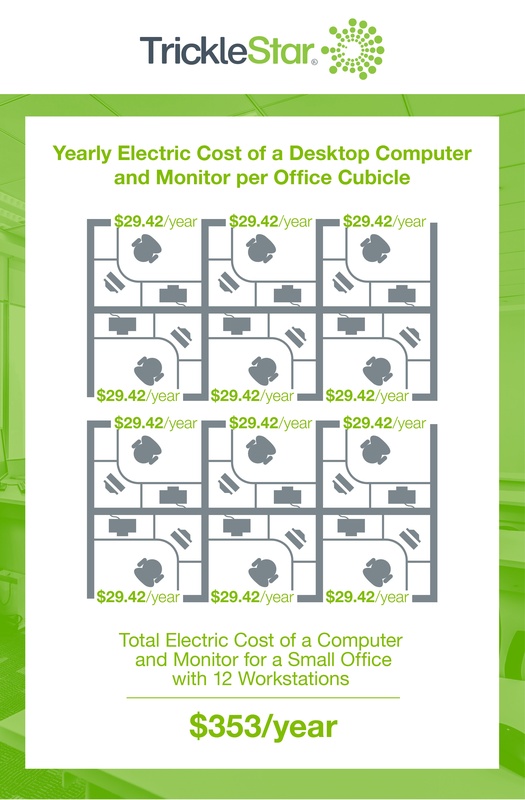 Even when these costs are scaled out across a small commercial office with only 12 computer workstations, the total electric costs can be quite large. The U.S. DOE recommends that computers, monitors, printers and other peripherals are plugged into a power strip and surge protector and that these power strips are switched off during periods of inactivity to prevent the devices from drawing power ("vampire loads"). Current recommendations suggest turning these devices off when inactivity is more than 20 minutes. TrickleStar's PC Advanced PowerStrip+ (PC APS+) automates this process and reduces active and standby power wasted in computer workstations while protecting workstation electronics against surges. Featuring a highly-accurate motion sensor, the PC APS+ detects user presence and automatically puts the computer and monitor to sleep when no motion in the work space is detected, then removes the power supply to peripheral electronics plugged into the switched outlets when the computer enters sleep mode. Using motion as proxy to monitor activity, as opposed to tracking activity via software installed on the computer, prevents the computer from inconveniently going to sleep and interfering with business activities. Best of all, the PC APS+ requires no system drivers or installation of software and is compatible with all major operation systems.